For the upcoming seventh installment of the Star Wars saga, Star Wars: The Force Awakens, stores around the world are stocked to the rafters with new movie-themed toys. But the most dedicated fans have been collecting memorabilia from the films since day one. A huge fan of the space opera and of collecting pop culture in general, Japanese designer and producer NIGO is following up last year’s "NIGO Only Lives Twice" event with another Sotheby’s auction that is 100 percent Star Wars-centric. "Return of the NIGO" features more than 600 lots, with rare action figures, mugs, posters, replicas, and helmets up for grabs on December 11. Because The Force Awakens is the seventh flick in the series, here are seven of the many rare objects that will soon hit the auction block. With only 20 known examples of this Kenner toy in the world, the word “rare” would be an understatement. 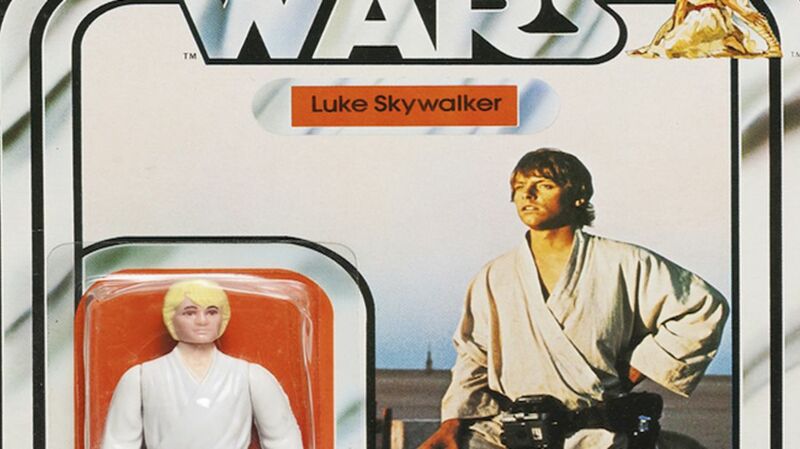 In addition to Luke having blond hair, the toy features an extra-long lightsaber that, according to StarWars.com, was also used on the first figures of Darth Vader and Ben Kenobi. Luke’s lightsaber is also yellow, not blue or green like the ones he used in the films. The toys were reportedly redesigned with single-telescoping lightsabers because the original versions were too easily broken. The big ticket item of the auction is this framed collection of two complete Kenner Power of the Force (POTF) coin sets. Each set has 63 coins in it, and they are framed so that the front and back of each coin is displayed. The coins themselves are pretty common as individual pieces, but complete sets are hard to come by and include rare prototypes. Rumor has it that only 10 of these framed sets were ever made, with three given to Lucasfilm and the other seven placed in the hands of Kenner executives. The retail version of this mid-1990s toy is still readily available on various ecommerce sites for less than $20, but prototypes rarely make it out of the factories or the offices of the people who play a part in designing and producing them. That makes it difficult to know just how many of these exist, and it makes this C-9 condition piece even more special (graded on a scale of 10, 10 being mint). Limited to 1259 pieces, this blaster was one in a series of weapon replicas made by Master Replicas in the early to mid-2000s. A screen used DL-44 Blaster recently sold for around $200,000, so this Lucasfilm licensed version is a great alternative for Han Solo fans who are on a tighter budget but still want to shoot first. This 1978 toy was sold in Japan and Canada, but only Canadian fans could buy the toy with this packaging (they were reportedly sold in baggies in Asia). The graphic makes the toy seem a lot faster than it actually is, but the winner of this auction probably won't want to test it anyway. Designed by Polish graphic artist Jakub Erol, this vintage poster for the first film of the original trilogy only features C-3PO. There were tons of poster variations for the Star Wars films over the years, but this one is interesting for the choices that Erol made with the simple design. The text translates to “American science fiction film Star Wars” and includes the name of the director, lead actors, and studio above a stenciled graphic of the droid with a black and white speckled background. Fan theories began to flow freely last year when one of the early trailers for Star Wars: The Force Awakens showed what appeared to be Luke Skywalker’s lost lightsaber being given to a new character. One of the most iconic weapons in all of Star Wars, any licensed variation of it is sure to garner attention from collectors. This replica of the original comes with a case and plaque signed by Luke himself, Mark Hamill.